Winner of the American Association of State and Local History Certificate of Merit! Possessing the flavor of all scenic New England railroads, the Rutland Railroad ran through Vermont and northern New York for more than a hundred years. Surviving bankruptcy, floods, and strikes, it competed with larger, stronger lines and struggled to operate on a smaller scale. Shaughnessy's The Rutland Road is a sweeping chronicle from pre-construction in 1831 to the twentieth century. Filled with over 500 photographs, the book contains some of the author's finest camera work. It will be of interest to railroad devotees, historians, and photographers. 488 pages, 625 illustrations, with photo album, rosters, maps, appendix, and index. 8 1/2" x 11"
Through the years poets and journalists have captured the character of the locomotive, some transforming it into an animate creature, others such as William Dean Howells and Thomas Wolf relating a symbolic odyssey by train. Here, in a pictorial history, Jim Shaughnessy turns an eloquent photographer's eye to the Delaware & Hudson, the line that began in 1823 as a canal system to transport Pennsylvania coal to New York State. The Delaware made early railroad history by operating the first steam locomotive in America, the Stourbridge Lion. Its president of thirty-one years, L. F. Loree--a highly irascible eccentric, who had an obsessive devotion to British design--was fascinated with experimental traction power and went on to produce the groundbreaking Loree locomotive. 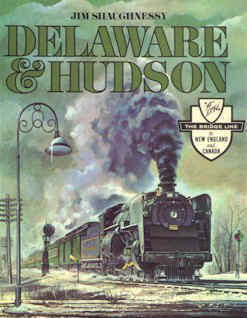 The Delaware &Hudson is an all-encompassing account of its 144-year history, which includes the mining in the region as well as the-steamboat operations along Lake George and Lake Champlain. Jim Shaughnessy incorporates over 600 photographs and illustrations, maps, and timetables. This book was originally published in 1967 by Howell-North Books. 436 pages, 537 photos & illustrations, with 19 maps, charts, reproductions of ads, and timetables. 8 1/2" x 11"
Jim Shaughnessy, a railroad photographer for over four decades, has an eye for composition which results in photographs that not only feature trains' mechanical details but also give consideration to the total interaction between the train, its surroundings and the human aspect of the overall scene. Mr. Shaughnessy is renowned for his pioneering night photography. He has contributed widely to periodicals such as Trains, Railroad, Adirondack Life, and Down East. In 1987 Mr. Shaughnessy was given the coveted Photography Award from the Railway & Locomotive Historical Society. 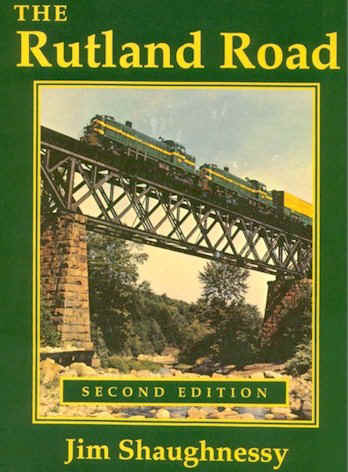 If the dust jacket on your original 1981 Howell-North second edition of The Rutland Road (the one with the VTR and GMRC updates) could use a new dust jacket, here is a chance to replace it! Jim Shaughnessy has a limited number of BRAND NEW, MINT CONDITION dust jackets available. They sell for $5.00 each plus $2.50 S&H and are mailed in a tube. Hey, even if you have a first edition, why not treat it to a new dust jacket?